Concept's ViCount range of smoke systems have been designed to produce an artificial smoke with an exceptional resistance to high temperatures (up to 200°C before layering commences). This compares to a layering temperature as low as 35°C for glycol type systems, or up to 60°C for the glycerol based system (like our Colt 4 and Spirit 900A systems). So if you have a requirement for smoke at elevated temperatures, be it for a Hot Fire Training simulator, hot smoke testing, or smoke extraction testing the ViCount system provides a cost effective, safe and completely controllable solution. Concept have such expertise in the field of high temperature smoke systems that we were commissioned by the UK Ministry of Defence to project manage a range of comparative tests prior to the selection of the smoke systems for the Royal Navy’s Fire Fighting Training Units. These tests involved the construction by FRS (Fire Research Station) of a purpose made chamber, with thermocouple grid, heat source (allowing the chamber temperature to be raised in a controlled fashion) and floor to ceiling pyrex window allowing observations and video recordings to be made of smoke layering as it occurred. Representatives of FRS, the MoD and the MoD’s management group were present during all testing. During the tests various smoke chemicals and smoke systems were used to produce and maintain a dense smoke concentration within the test compartment, as the temperature within the compartment was slowly raised. This enabled the specific layering temperature of the smokes to be assessed in controlled conditions, and resulted in the selection of the Concept ViCount as the exclusive smoke generator system for the Royal Navy's hot fire training centres. Other specialists involved in these tests included Department of the Environment, FRS Cardington, Atomic Energy Authority Harwell, and an eminent independent analytical laboratory. The smoke produced by these systems must not only be temperature resistant, but must be capable of achieving the dense smoke concentrations required for training in heated conditions without forming a flammability or explosive hazard in its own right. Independent tests by the Defence Research Agency demonstrated that dense smoke conditions could be achieved at < 4% LEL, even in a compartment with a widespread “real fire” scenario running. 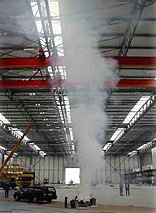 The temperature resistance of the ViCount smoke makes it ideally suited to a number of other applications, including Hot Smoke tests such as that shown above (Airbus Industries - Hamburg. Courtesy of Hugin Group International). 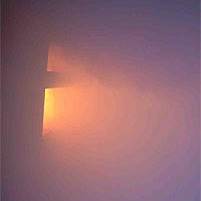 "We use smoke generators for fire simulations and positive pressure ventilation training for approx 10 hours per week. The Smoke adds realistic conditions for Fire Fighters to train in but with safety in mind. This has been a very useful course, full of practical information and help for the maintenance and operation of the smoke generators. It was a very useful opportunity to meet the company and to have face to face contact. Everyone was very helpful."